Okay, I’m a bit fuzzy. I’ve been making the day my mantra….it’s Wednesday….it’s Wednesday…it’s Wednesday…right? We pulled into L.A. on Monday night after getting trapped in San Francisco traffic. Crashed in the land of Garlic…Gilroy, California. On our drive through the Monterey Peninsula, I saw artichoke plants….swear to the heavens…artichoke fields! The drive on US-1 south along the coast was spectacular. Here’s the thing….California is IMMENSE. Colorado….drive in any direction for a few hours and you’re somewhere else. California….three or four days to get through. Each area with a different geography….amazing. We hit L.A. and missed the traffic….thanks to Oh Holy Garmin! Made it to my grandmother’s in San Gabriel in plenty of time to enjoy Macho’s Cafe. I slept in a real bed….slept! I squeaked the camper into the back yard so that I could drive the Jeep in the city without hinderance. I should have taken pictures….it was a squeaker! Managed to stop in and drop of the niece, take a nap, visit with my aunt and uncle and meet with my graphic artist…okay, he’s my cousin, but it counts. I pulled out at 8:30….the earliest yet! It was hard saying goodbye to the dotter, but she’s in the bosom of my family and on her path. Sniff, sniff. I drove east into the Palm Springs desert towards Lake Pleasant, Az. Staying tonight with my childhood friends, Tom and Peggy. Technically, they’re my parents friends, but such wonderful people! Dear hubby and I are fortunate to be surrounded by people of magnificent spirit. I rearranged the Jeep to facilitate easier stops without the camper, but the girls weren’t too happy with the big, blue bean bag…it’s too full. 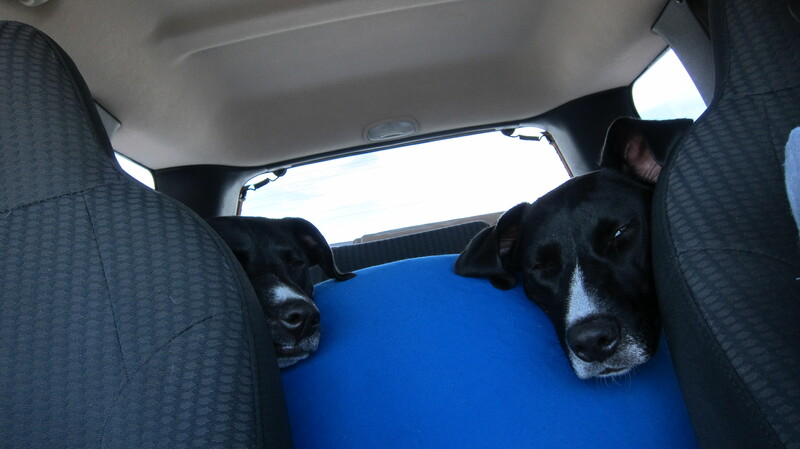 It was a long drive for the dogs as I only stopped at the half way point. Blythe was so hot that the dogs refused to pee. 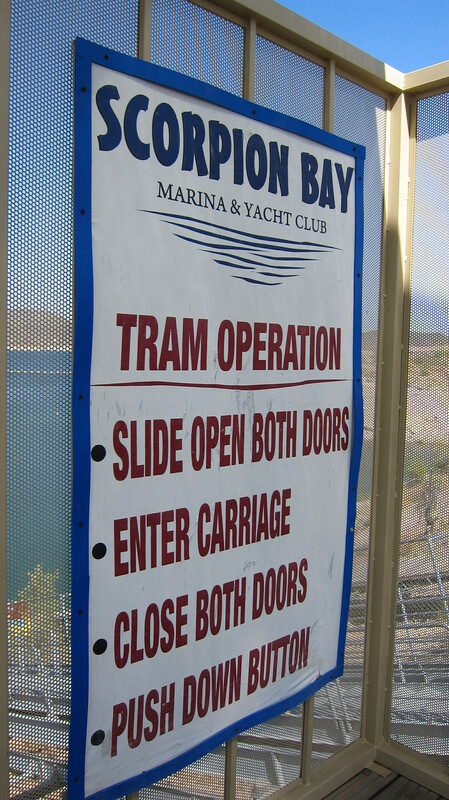 They were a tad desperate by the time we reached Scorpion Bay. Tom and Peggy live on a houseboat. My dream come true. Swimming every day….sunsets and stars. I MIGHT be convincing Dear Hubby/Beard that we could both work remotely….70k for a four bedroom boat, six hour drive from LA, twenty minutes from Phoenix AND WIFI? Sign me up! After a drive through the desert, a swim and a margarita….I feel restored! The dogs are watching the ducks and Tom loves the dogs. We’ll see how a night on the boat goes. I will say the dogs are not shivering….in fact there are lengthy expanses of tongues exposed. Thursday Morning, day 12: A two mile walk at 5:30 a.m.set things to rights and offered the dogs some much needed exercise. They were treated to an interlude with a wild donkey….you can imagine. Oona is perplexed as to why her breakfast is delayed, but I’ll feed them up at the truck. Coffee, perhaps a swim and then off to the gorgeous destination of Gallup, which is really just a crash in a hotel room before the drive to Espanola. 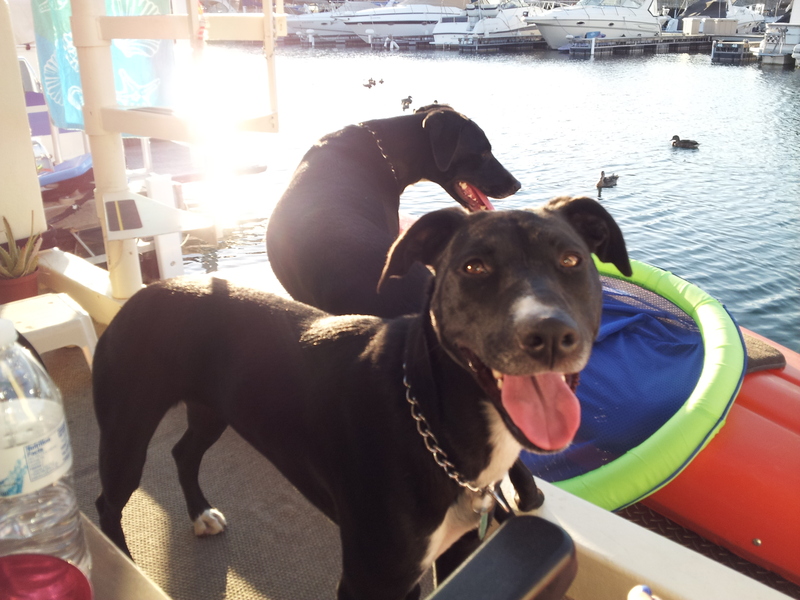 I’m all about life on the boat…a walk in the morning, a swim before breakfast, coffee on the deck. Another five+ hour drive to Gallup and a hotel room. Not my favorite plan….but the desert is very hot and the camper is not in condition for me to put it up alone. Espanola is an 8 hour drive from Scorpion Bay….too long for me! I’m loving my time with Tom and Peggy….if there wasn’t a small disaster to help Dear Hubby with at home, I’d be tempted to stay a bit longer. The dogs might find that discomfiting. The boat has them completely confused. They haven’t been tempted to jump off of the back even for the ducks that Tom feeds. I’m not certain that they wouldn’t sink. The step from the dock to the boat has become less perilous. Not certain if I’ve posted (coffee hasn’t hit), but we were struck by a massive hail storm that caused substantial damage to the house, the yard and the cars. It’s a lot to deal with alone….so I’m headed back with an eye on the calendar.